Undefeated Oriental Pacific Boxing Federation super flyweight champion"King" Arthur Vilanueva is confident of winning the vacant IBF title when he clashes with unbeaten Puerto Rican southpaw McJoe Arroyo at the Don Haskins Convention Center in Houston,Texas on July 18. Villanueva left for Los Angeles with trainer Edito "Ala"Villamor and will wind down training at the Wild Card Gym of Freddie Roach. Villamor said Villanueva who has a record of 27-0 with 14 knockouts was in great shape and is confident of winning the world title although he conceded that McJoe Arroyo is a talented fighter but believes he is not as good as his identical twin brother McWilliams Arroyo. ALA Gym head trainer Edito “Ala” Villamor told us that Villanueva was ripped and ready and looked good in sparring twice over ten rounds against southpaws, since Arroyo is a lefty and he needs to get used to fighting southpaws. 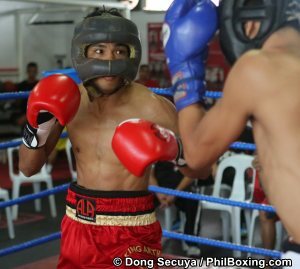 One of the sparring partners was Joy Joy Formetera, a 21 year old southpaw from Cebu City who has a solid record of 6-1 with 4 knockouts, all in his last four bouts with a 2nd round knockout over Allan Doronilla in his last bout on June 7. Formetera’s only loss was in his pro debut against Rolando Servania who was also making his debut in a four round bout on January 20, 2013. He said they are also recruited an amateur from Bohol who is a southpaw to help enhance Villanueva’s hand-speed, reflexes and movement while well known American strength and conditioning coach Nick Curson worked with Villanueva to get him into the best physical shape for the tough test against the 29 year old Arroyo who has an unblemished record of 16-0 with 8 knockouts. Arroyo earned the title shot when he scored a lopsided win against Filipino Mark Anthony Geraldo in an eliminator in Puerto Rico on December 30, 2014. He also scored an impressive 11th round knockout over former world flyweight champion Hernan “Tyson” Marquez on June 14, 2014 in Mexico after capturing the vacant WBA Latino title with a 4th round TKO victory over Felipe Rivas on February 2, 2013. Photo: Arthur Villanueva (L) in a recent sparring session in preparation for his world title fight against McJoe Arroyo of Puerto Rico on July 18 in Texas. Photo by Dong Secuya.